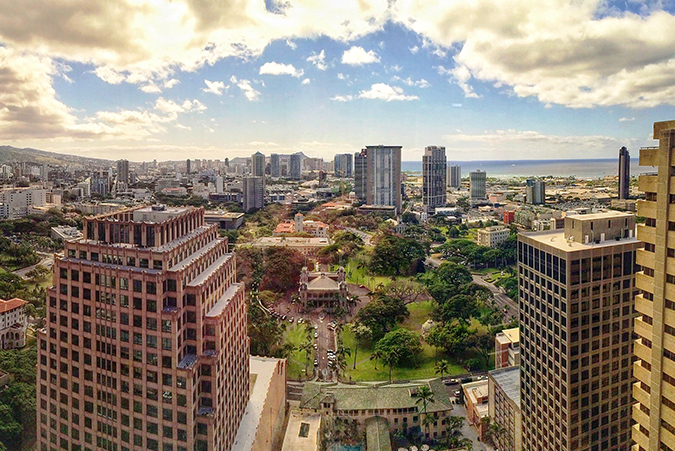 Welcome to our Pauahi Tower at Bishop Square location at 1003 Bishop Street, Suite 2700, Honolulu, HI 96813. Our 13,465 square foot executive suite has 53 newly built-out window and interior offices to accommodate all your business desires and needs. With Premier Workspaces, you can experience the best of the Honolulu corporate atmosphere with one monthly invoice and no capital investment. 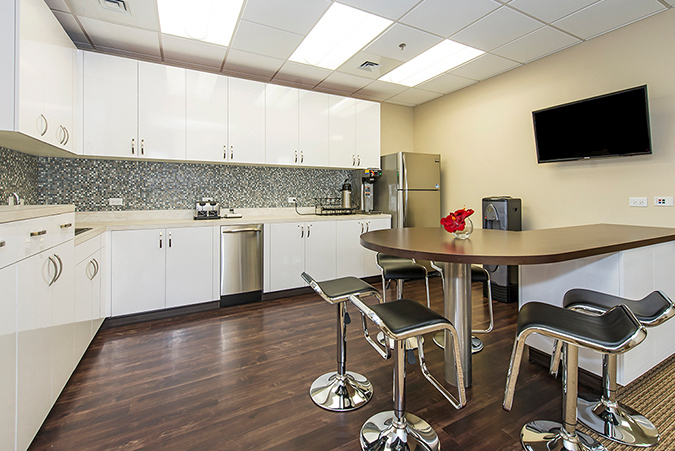 The central courtyard is highly convenient, offering multiple eateries, including Jack in the Box, Aloha Sushi, San Francisco Salad, Cookie Corner, and more. There are two Starbucks locations across the street, along with a Subway, 7-Eleven, and Hukilau Restaurant. There is also a Wal-Mart, Ross, and Walgreens about a block away. Honolulu is full of history, and the Pauahi Tower is within walking distance of the Iolani Palace, the State Capitol, Kamehameha Statue, Aloha Tower, and more. The First District Court is across the street, and the Federal and Family Courts are both within walking distance making for a very convenient location. Pauahi Tower is located in the heart of Honolulu's Central Business and Financial District, a premier business environment The property encompasses a full city block and is surrounded by Bishop, King, Alakea and Hotel Streets. This landmark location is situated ideally on these main thoroughfares which envelop Honolulu's unique business history, past and present. 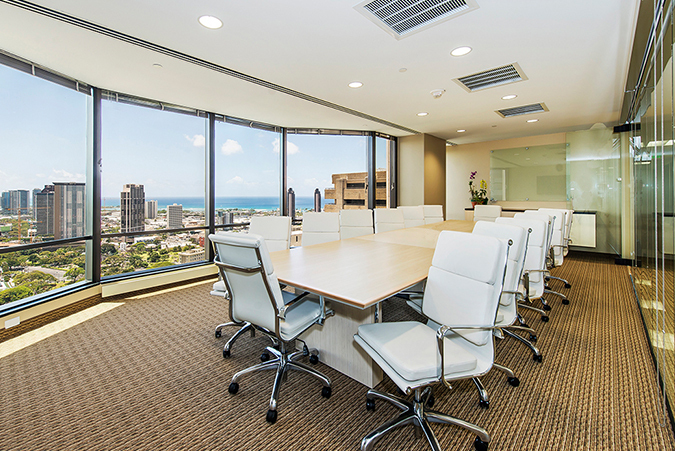 We offers flexible term Honolulu executive suites, including full-service office space, virtual office addresses, day offices, meeting room rentals, and much more. 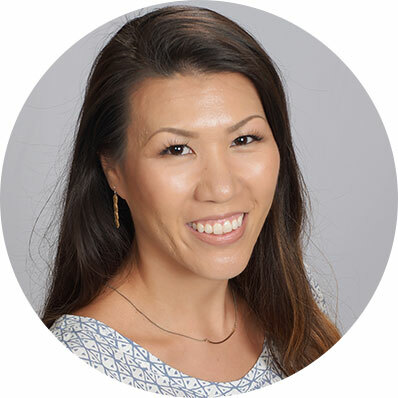 Not only can you obtain immediate occupancy, but we offer short-term agreements that allow you the flexibility to expand or cut back your business space on short notice; a choice not usually available in the traditional O’ahu office space market. 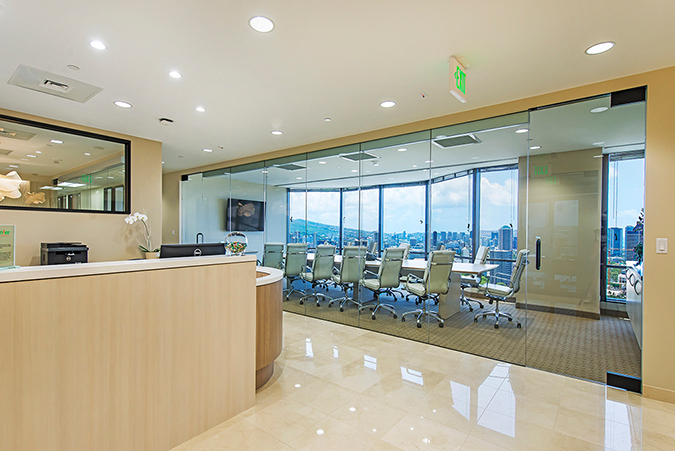 In addition to a furnished office space, PBC’s Pauahi Tower executive suite offers the tools you need to continue a successful business, including high-speed internet access, personalized telephone answering, mail service, voice mail, secretarial services, appointed conference rooms, a reception area, and a kitchen. 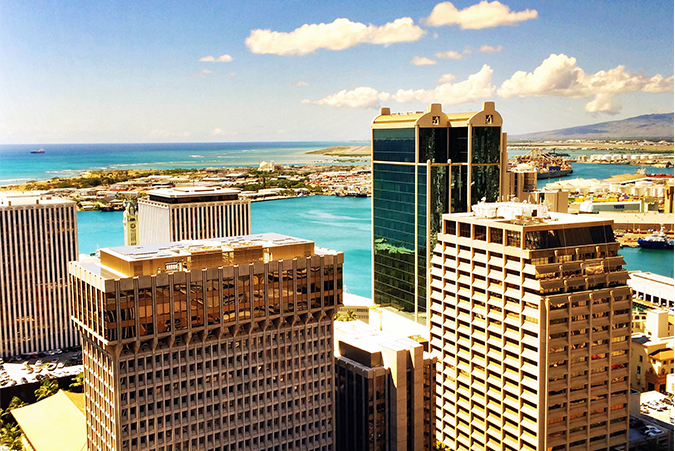 Some of our 27th floor turn-key office suites offer unobstructed, panoramic views of Honolulu Harbor, Sand Island and the majestic waters of Mamala Bay. Our Honolulu virtual office plans are ideal for businesses that require a professional address and occasional use of a day office or meeting room. Clients have the opportunity to share a prestigious office space, without having to pay the full-time cost. Premier’s virtual office plans include most of the same benefits provided by a full-time agreement, including a friendly and professional administrative staff.